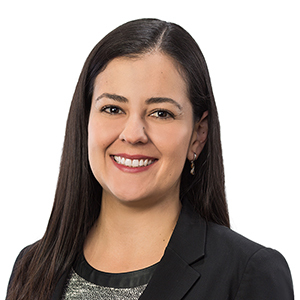 Angela is an associate in Gowling WLG’s Calgary office, practising in the area of insurance and professional liability. Angela has experience in insurance defence litigation matters in areas including: property damage, breach of contract, personal injury, professional regulation, subrogation, occupiers’ liability, insurance coverage issues and construction deficiency disputes. Angela has appeared in Provincial Court and the Court of Queen’s Bench of Alberta for ex-parte and contested applications. In early 2017, Angela ran a Provincial Court Trial and obtained a successful outcome for her client. Prior to attending law school, Angela spent a few years working with two separate environmental consulting firms. In that capacity, she worked on regulatory aspects of pipeline projects and completed field work related to Water Act applications and NEB hearings. After completion of law school, Angela worked as an associate for a Calgary based multi-service law firm. Angela was born in Colombia and is fluent in both English and Spanish. Richard Frimpong Oppong & Angela M. Barreto, “Enforcement” in William A Schabas & Shannonbrooke Murphy, eds, Research Handbook on International Courts and Tribunals (Cheltenham: Edward Elgar Publishing Limited, 2017).